Bridge, and its “little brother,” MiniBridge, are both fantastic games and great fun for any age! Both games develop not only mathematical and logical abilities, but also social skills such as teamwork, listening and rule following. This is because they are always played in pairs – a bridge player can only ever be as good as the partnership that they have developed with another player. The benefits of bridge for young people have been investigated and shown in a number of studies, including one at a primary school in Manchester which was commissioned by the English Bridge Union in 2001. The benefits suggested by this study included ones related to maths, non-verbal reasoning, problem solving and the ability to focus and concentrate, as well as a range of social and behavioural skills. 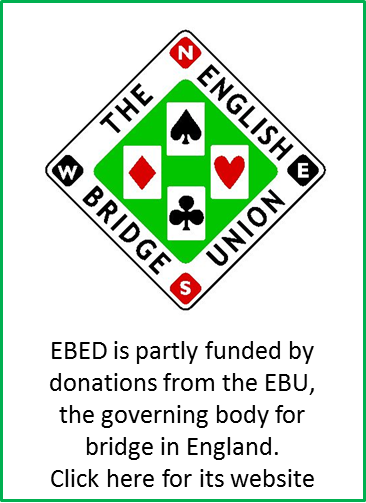 As the national charity for the promotion and development of bridge, EBED are committed to helping as many young people as possible to learn to play. We do this by running some of our own events for all standards of young bridge player from absolute beginner to junior international, and also by supporting schools, county bridge associations and individual bridge teachers and clubs in their efforts to spread the word about this superb game. We have also developed a Junior Award Scheme, to help bridge teachers structure their activities with young people and to give young bridge players recognition for all their hard work! You can read more about our work with youth bridge by clicking the links above.